Outdoor decks are often a cherished space by homeowners. Fences can add a sense of beauty, serenity and safety to a home. But when these exterior amenities are exposed day in and day out to the elements, they can quickly look worse from wear. If your deck or fence needs a facelift, a refresh or a full-on overhaul, deck and fence staining professionals are the best choice over tackling the project yourself. Here’s why. We give this step on nearly every one of our articles about staining, but that’s because we understand the fundamental importance of it. Time and again we’ve seen what can happen when surfaces are not prepped properly before painting. The result is often not only unsightly, it can also cost hundreds of extra dollars and hours to repair, so our team of professionals will prep wisely and well. We clean and prepare at the right time of year. This step will be much harder if outdoor conditions are overly wet, cold or humid. All wood—new or old—is cleaned before staining. That includes “mill scale” on new wood, and stains, plus mildew and dirt from old wood. We replace rotted wood. This is essential to ensure a long-lasting, even stain. We remove peeling stain. This step is crucial for a smooth finish. We apply two coats of stain. This is important to ensure full coverage. Once the deck or fence is ready, it’s time to rinse, spray and pressure wash. When the wood is completely rinsed and free of grit, dirt, mildew and particles, it must dry completely before staining. Next to meticulous and thorough prep, we choose a high-quality stain to ensure the look and protection of your deck and fence for years to come. Outdoor stains have come a long way over the years and contain fewer harsh chemicals than before while adding better protectants. We will help you choose a stain that is both in keeping with your overall desired look and environment. For example, if you live in a humid environment, you will want to invest in a stain that has mildewcide benefits. There are lots of ways to apply stain to achieve a professional result. From brushes, rollers and sprayers, we work with the right tools to deliver only the highest quality results. Properly stained decks and fences are best tackled by a knowledgeable and patient expert. Staining or re-staining your deck or fence is not a DIY project, nor is it a quick one or two-day “weekend warrior” gig. 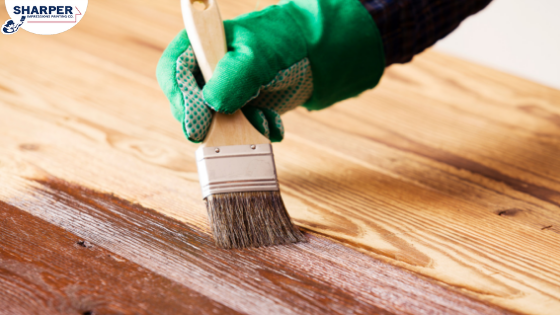 Do you stain decks or fences every day? Professionals do! This means they can ensure your project is completed in one day. The average DIY homeowner can expect to complete a deck or fence staining project in three weekends, but professionals are in and out quickly so you can enjoy your deck sooner. The look and finish of your deck or fence will look better and last longer in the hands of professionals who take their time to get the best results. We promise it will save you hours of elbow grease (at minimum) and money in the long run when you don’t find mistakes or have to redo it in a year. Just think about the money you can save not having to rent power-washing tools! Plus, the right stains, tools, brushes, tarps, and rollers can cost a pretty penny. Professionals already have the best products and equipment on hand and don’t need to buy anything new which cuts down on costs. Save time, money and costly mistakes with our deck and fence painting and staining services. Get a free quote today!